And why does everyone ask you when you’re going to have a baby? 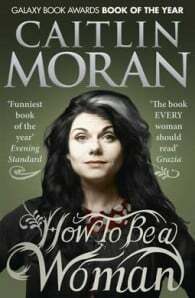 Catherine Elizabeth "Caitlin" Moran (born 5 April 1975) is an English journalist, author, and broadcaster atThe Times, where she writes three columns a week: one for the Saturday Magazine, a TV review column, and the satirical Friday column "Celebrity Watch". Moran is British Press Awards (BPA) Columnist of the Year for 2010, and both BPA Critic of the Year 2011 and Interviewer of the Year 2011. In 2012, she was named Columnist of the Year by the London Press Club,and Culture Commentator at the Comment Awards in 2013. Moran was convinced throughout her teenage years that she would become a writer.At the age of 13 in October 1988 she won a Dillons young readers' contest for an essay on Why I Like Books and was awarded £250 of book tokens. At the age of 15, she won The Observer's Young Reporter of the Year. She began her career as a journalist for Melody Maker, the weekly music publication, at the age of 16. Moran also wrote a novel called The Chronicles of Narmo at the age of 16, inspired by having been part of a home-schooled family. In 1992, she launched her television career, hosting the Channel 4 music show Naked City, which ran for two series and featured a number of then up-and-coming British bands such as Blur, Manic Street Preachers, and the Boo Radleys. Johnny Vaughan co-presented with her on Naked City. In 2014, Moran released her semi-autobiographical novel, How To Build a Girl, set in Wolverhampton in the early 1990s. It is the first of a planned trilogy, to be followed by How To Be Famous, and concluding with How To Change The World.